Hollie Sackett and Taylor Sackett. "California Death Index 1905–1939", digital image, Ancestry.com, "Sackett, Frank, d. Los Angeles, CA, 11 May 1923, age 47." "Utah, County Marriages, 1887–1937", database, Ancestry.com, "24 Dec 1900, Salt Lake, Utah, Frank E Sackett, 24, and Etta May Ellison, 21." 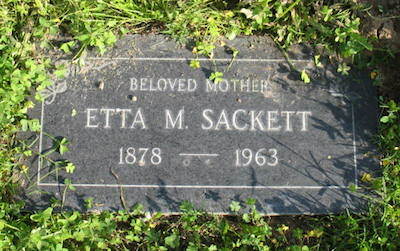 "California, Death Index, 1940–1997", database, Ancestry.com, "Sackett, Etta M, b. Utah, 25 Jul 1878, d. Los Angeles, 19 Jan 1963." [Father's and mother's birthplaces in children's entries were recorded incorrectly and should have read "father b. MA, mother b. MO"]. [+ 4 male boarders & 1 female servant]. Sacket, Clyde, son, 1 2/12, b. UT, father b. UT, mother b. UT. "US City Directories, 1822-1995", digital image, Ancestry.com, Long Beach, California, City Directory, 1917, "Sackett Frank E (Ettie) driver h 2141 Lime. "; 1921, "Sackett Frank P (Ettie) driver h 2443 Elm av. "; 1922, "Sackett Frank (Ettie) slsmn h 1375 Orange av. "; 1923, "Sackett Frank E (Ettie) driver h 1375 Orange av." "US City Directories, 1822-1995", digital image, Ancestry.com, Long Beach, California, City Directory, 1925, 1926, "Sackett Etta M (wid F E) h 1873 Alamitos. "; 1927, "Sackett Etta M (wid F E) h 1850 Lewis av. "; 1929, "Sackett Ettie M Mrs lndywkr h 1366½ Cherry av. "; 1931, "Sackett Etta (wid F E) lndy wkr L B Community Hosp h1076 Obispo av. "; 1933, "Sackett E M Mrs lndywkr h1715 Termino av. "; 1935, "Sackett Etta M (wid F E) h3223½ E 15th. "; 1943, "Sackett Etta kitchenwkr SMH r1484 Henderson av." Sackett, Don, son, 10/12, b. UT, father b. UT, mother b. UT. Sackett, Donald M, son, 11, b. UT, father b. UT, mother b. UT.